The Division of Gynecologic Oncology and Robotic Surgery has a simple mission: provide you and your loved ones the most comprehensive, compassionate and personal gynecologic oncology and complex pelvic surgical care, with your satisfaction and best outcome as our central goals. Our core value is to deliver the highest-quality care to patients in the Hudson Valley area seeking the best available treatment, with the convenience and comfort of being close to home. Since its inception in 2009, our department has cared for thousands of patients, providing the highest quality of compassionate, personalized and state-of-the-art gynecologic oncology services. Our team includes fellowship-trained, board-certified gynecologic oncologic/pelvic surgeons, physician assistants, nurse practitioners, nurses and social workers, as well as dedicated administrative staff committed to the best care for you and your family during this challenging time. Our focus is to provide you with multidisciplinary and integrated oncology treatment accessible under one division. 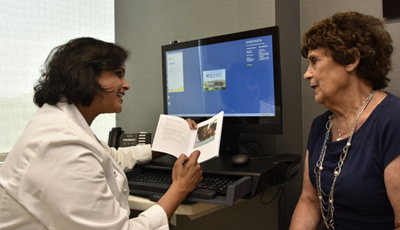 We have the latest treatment options for all types of gynecologic cancers, including minimally invasive, robotic and radical surgery, as well as chemotherapy and targeted therapies. We also offer state-of-the-art outpatient infusion services, renovated inpatient rooms and the latest medical technology. In addition, we provide access to the latest clinical research, along with collaborative care with experts in radiology, pathology, palliative care, pain services and radiation therapy. Clinical trials are available to our patients, thus improving access to new therapies. We believe in continual education. By training others in women’s health, we hope to ensure that future generations of women receive excellent clinical care. We also keep current with all the latest research and advances in our field. Medical students, residents and fellows in various stages of training specifically elect to learn from our team. We know that being referred to a cancer center or requiring a complex operation can be life-changing. We want to comfort you that by choosing the Division of Gynecologic Oncology and Robotic Surgery as part of your healthcare team, you and your family will experience the type of care we would provide our families and loved ones. 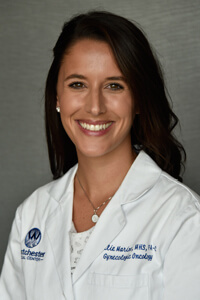 Gynecologic oncology diagnoses and treats the five main cancers that originate in women’s reproductive organs—ovarian, cervical, uterine, vaginal and vulvar. Each year, almost 82,000 American women are diagnosed with one of these conditions and more than 28,000 will lose their lives. 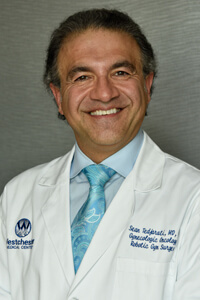 Fortunately, many of these cancers are highly treatable and even curable with the comprehensive, multidisciplinary preventive and treatment approach employed by Westchester Medical Center’s Division of Gynecologic Oncology and Center for Robotic Gynecologic Surgery. Our services include radiation therapy and chemotherapy, counseling, prevention and treatment for women at risk of developing gynecologic precancerous and cancerous conditions, state-of-the-art surgical care including da Vinci robotic surgery, and a research program. We also take pride in our programs of support for patients and their families. 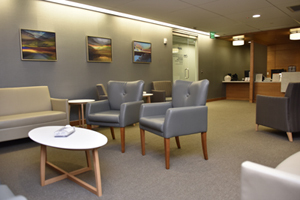 The Division of Gynecologic Oncology offers patients outstanding personalized care in beautiful private rooms. In addition, our new state-of-the-art outpatient center offers easy access to ongoing aftercare and outpatient services. 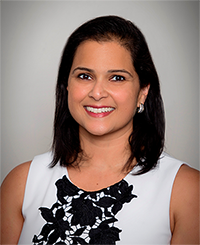 Our division devotes its clinical time exclusively to the medical center’s patients and collaborates with other nationwide cancer researchers on clinical trials funded by the National Cancer Institute to better delineate treatment protocols for all types of gynecologic cancers. Trials are conducted through the Gynecologic Oncology Group, an arm of the National Cancer Institute. 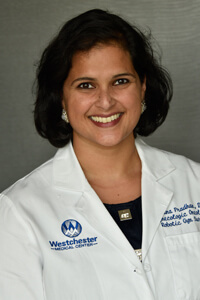 At Westchester Medical Center, we treat ovarian, Fallopian tube and primary peritoneal cancers, endometrial/uterine cancers, gynecologic soft tissue tumors (including sarcomas, cervical cancer, vaginal and vulvar cancers), and gestational trophoblastic disease (molar pregnancy). 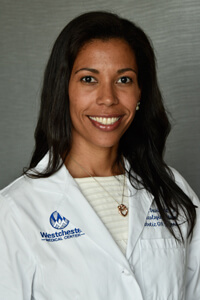 Our Gynecologic Oncologists at Westchester Medical Center are the highest volume providers of minimally invasive robotic surgery, offering expert treatment of complex benign and cancerous gynecologic conditions. We are able to perform these complex surgical procedures with precision and accuracy using this minimally invasive surgical platform, offering our patients the most advanced surgical technology available. Along with a dedicated team of nurses and anesthesiologists, we provide our patients with compassionate care and ensure the best outcomes. For eligible patients, this minimally invasive approach results in less pain, quicker recovery, and a decreased risk of infection or other complications.